One of the last remnants of Hollywood’s Golden Age, Grauman’s Chinese Theatre stands as a tribute to the movies that started it all. In light of the recent film Hail, Caesar!, I thought it would be interesting to take a closer look at the old studio system and whether resurrecting some of the practices might actually prove to be a positive affect upon employment in media and entertainment. The entertainment industry is evolving more quickly than it ever has, and film production companies and distributors are of no exception. Just like the advent of television had a major influence on the sharp decline of movie patrons in the 1950s and 60s, the advent of on-demand and streaming “television” and movie content today is having a major impact on entertainment sources today. But this article does not aim to analyze distribution, production, nor revenue; its aim is to analyze the state of employment opportunities in the film and narrative television industries. What better way to begin to explore this controversial topic than with the studios that started it all. The rise and fall of the former “studio system” lasted for a period from the 1920s to the late 1960s, with the 1940s to the 1960s being the period of the downfall. During this time, there were five major film studios known as the Big Five, essentially controlling the film industry from production to distribution. 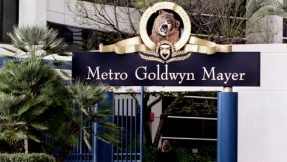 The Big Five consisted of Paramount, MGM, RKO, Loew’s, Fox Pictures, and Warner Brothers. Though not as prominent, three smaller studios known as the Little Three, consisting of United Artists, Universal, and Columbia Pictures, were the chief competition. Regarded as the end of Hollywood’s Golden Era, the landmark Supreme Court decision in United States v. Paramount in 1948 marked the delcine of the Studio System. In short, over about a 15-20 year timespan, studios began opening their lots to independent filmmakers–independent of the Big Five (not independent by today’s definition), terminating permanent staff members, and refraining from entering into longerm contracts with performers and movie houses. Although the Walt Disney Company was not part of the Big Five nor the Little Three, it is the only studio today still operating as a studio from the old Studio System. With the major studios today only producing about 20 films a year, the majority of films releasing in first-run movie theatres are produced by independent producers. As stated earlier, this is not independent as we think today; independent by this definition means movies produced outside of the major studios, but often distributed by them (or a subsidiary). Think: Star Wars or Jurassic Park. Since the fall of the Studio System, big banks are more reluctant to invest in or finance films, so producers are responsible for securing their own funding. Less funding means fewer job opportunities for film and television graduates. Most film and television professionals in the entertainment business today are independent contractors–being attached to films and television shows for however long the production time or run-length is. Although a long-running television show provides more employment stability than films do, both are high risk professions. Of course, along with the high risk comes potentially great rewards. 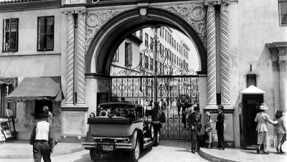 According to Hollywood folk lore, making a wish at the famed Bronson Gate is said to bring good luck. This is me (30lbs ago!) 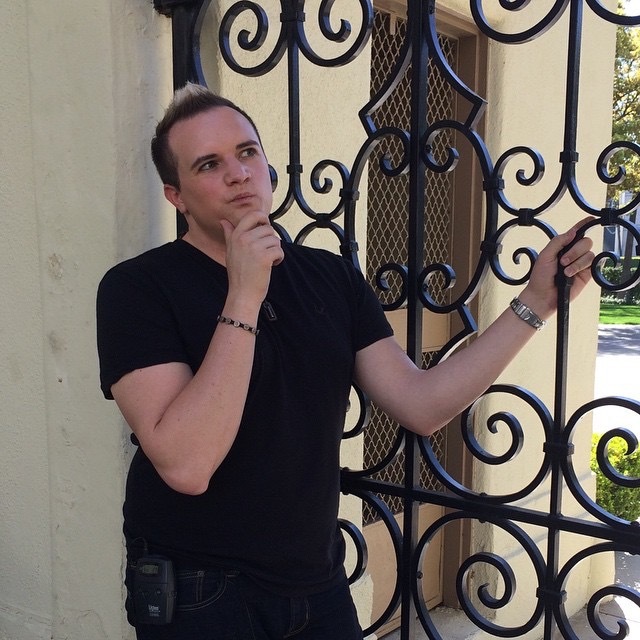 on the Paramount Studio tour in March 2015. Why would the return of some semblance of the old Studio System be a good turn of events in today’s economy? Simply stated: more jobs and opportunities for budding professionals and college graduates. Why is that? Any first-year film student can tell you that studios keep a low threshold of permanent staff members in administration and production. The majority of talent and crew on each film is independently contracted. And with gaining entry into a union becoming increasingly difficult, it leaves many potentially talented professionals out of work or in low-pay positions on low and moderate budget films. If the Studio System were to return, they would have the collateral that big banks are looking for to invest in films. After all, film, television, and to some extent theatre, are the United States’ largest exports even though they are only recently counted as part of the U.S.’ GDP (gross domestic product) in terms of evaluating the health of the economy. If there were more permanent positions in production with studios and production companies, the unemployment rate would drop significantly in entertainment because budding professionals and college graduates could land positions in which they could grow and excel. But what about exploitation and monopoly? Are those not reasons why the Supreme Court stepped in? Yes. However, there are many reasons why personnel in entertainment today, as permanent staff members, would not undergo the same treatment. The reason: unions. SAG-AFTRA, IATSE, TEAMSTERS, and EQUITY do an excellent job at protecting creative peoples’ rights and opening doors of opportunity. But, it is becoming increasingly difficult to gain access into these organizations. And with the unions being the gatekeepers to opportunity in the industry, where is a budding professional or college graduate supposed to go? If studios produced more in-house movies and television shows, then that would require them to hire permanent staff members. Those seeking a career in the industry would find their place. Some may argue that production companies offer internships to recent graduates; but with lawsuits increasing in the last few years, internships are increasingly being seen in a negative light. One hypothesis is that unpaid internships are taking the place of entry level jobs. With the number of entry-level jobs decreasing since the recession began, the unemployment rate in entertainment is rising. One way to combat the increased unemployment in entertainment business is to bring back the large studios that have the financial assets to offer and hire permanent positions. This would enable the studios to hire a number of cinematographers, writers, directors, etc. And, those individuals would work on the films produced by the respective studios. If studios were to increase the number of films produced each year, as they once did, then there would be more opportunities for professionals. 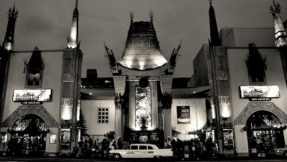 Regarding the monopoly studios had on movie houses, the present laws on the books would not allow for a studio to have complete control over a particular theatre chain. There is plenty of room for studios and production companies large and small. 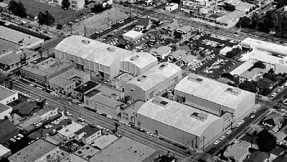 Unlike the days of the Studio System, in which outside companies could not shoot films or television shows on another company’s lot, the smaller studios should be allowed to still rent the stage and lot space as they do today. Of course, if Studios were producing more movies on their lots, that may cause the smaller companies to have to look elsewhere for locations. But, that could be a good thing; because if they purchased land for a backlot or sound stages, that would create more jobs for craftsman. In order to combat the rising unemployment rate in the entertainment business, professionals need to get together to develop ideas as to how to hire more personnel. Bringing back the Studio System is just one idea as to how to create more full-time jobs in film and television production. With studios forced to produce more movies in order to make payroll, that could potentially mean more writers can sell their scripts and perhaps more original ideas will make their way to the silver screen. This action could create human resource databases at the various studios and production companies that would advertise vacant positions. Just like applying for a job at Disney World, you could see what positions are available. Bringing back a new Studio System would allow for studios to advertise full and part-time regular positions. For instance, you could see which studios are hiring cinematographers, directors, composers, etc. Professionals in the creative and technical arts would also benefit from employer provided health insurance and retirement. Although as independent contractors, film and television professionals make more money than working as a regular employee, regular employees benefit from regular paychecks and benefits, and to an extent job security. Technology is making the production of movies and television shows more efficient than ever, so a major studio could hire permanent staff members to work as producers, directors, screenwriters, cinematographers, etc. Employment opportunity and stability are key elements to the health of an industry–even creative ones. Even though the old Studio System ran unchecked for many years, causing the eventual breakup, carefully constructed and regulated today, the return of a new Studio System could mean more jobs and opportunity for college graduates pursuing entertainment business careers. And just maybe, more movies! This was so utterly fascinating to read. I love anything to do with the history of movies and the industry. I am so glad that you found it fascinating! Before writing my M.A. thesis (and publishing a book) on the relationship between cinema and theme parks, I was actually doing a prolific amount of research on entertainment industry employment for aspiring professionals. Well all I can say is that your writing is marvellous and your research has really paid off. Keep up the great work.